Thanksgiving is a great time to visit Cape May. The town takes on a festive holiday atmosphere and for many it's a favorite time of year to enjoy Cape May's special charms with family and friends. Each year our house guests have asked for recommendations for how to best enjoy a great Thanksgiving meal while they're in town. So we thought we'd put our local expertise to good use and recommend a few options to enjoy Thanksgiving Cape May style. The turkey and trimmings — One of the great benefits of staying in a guest house during a Cape May visit is having full access to a working kitchen and dining room area so you can really make the cooking be a special part of the day for your whole family. Just like it would be in your own home.If you're staying in a guest house, and especially if you're big on the tradition that requires a home cooked Thanksgiving turkey feast (that was always oiur preference), here are some helpful suggestions. First off, the turkey. If you're really picky about having the perfect turkey, you may want to bring one from your home town to ensure you get exactly what works best for your group (turkey size, quality etc.). If you buy your turkey here, we recommend shopping at the the North Cape May ACME. They have a much bigger and higher quality selection than the Cape May AMCE. Note: Even though our local Cape May ACME is only 3 blocks from our house (and typically we'd recommend to stick with a local source), we've been burned too many times with poor service, sub quality produce and inflated prices. The North Cape May ACME will have most of your shopping needs covered and you won't be gouged on prices. You may, however, want to call ahead to find out the turkey availability so you can plan accordingly should they be sold out. 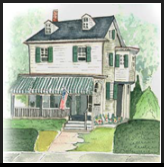 Click the following link to find contact information and a google map directions for the North Cape May ACME store. Appetizers, H'ordeuvres and Snacks — For yummy appetizers like cheese, pate, spreads and fresh bread, you need look no further than Cape May's own Seaside Cheese Shop. They really have a great selection and feature many seasonal specials including wine pairings with local establishments like the Washington Inn. If you go ask for Steve and tell him you were sent by the Longfellow Guest House and he'll be sure to take care of you. Desserts — Thanksgiving has always been a favorite time with regards to desserts for oiur family. And one of our favorite local places for sweets and desserts (in any season) is in West Cape May at Ellie's Bakery. We like them so much we even did a little write up about them here. We can't recommend this place enough, and if you go be sure to ask for Ellie herself and tell her the Longfellow House sent you. They are typically open for Thanksgiving but only the weekend before not the weekend after. So if you order from them be sure to plan accordingly. In addition to their world class sticky buns and pastries, they should have a fun seasonal selection suited just for the Thanksgiving Holidays including pumkin and apple pies, bourbon chocolate cake, and something we've never tried but sounds incredible — Michigan Cherry pie. According to Ellie it has a nice tart and full rich flavor found only in those special cherries. Ellie's only makes that pie if they get a supply in of those specific cherries so you may want to call ahead if that interests you. Here's Ellie's Bakery Facebook listing. Wine, beer and Liquor — For wine, beer and liquor we recommend Collier's Liquor Store right in town center on Jackson Street near the walking mall. Definitely get your supplies ahead of time because typically there's a rush right before Thanksgiving day. And don't forget to stock up on extra ice. Now if you're big on having your Thanksgiving meal be as simple and carefree as possible, here an awesome option. And this can work weather you're staying in a guest house, a hotel room, or condo. Order a Thanksgiving meal take out! The Depot Market Cafe has for a few years running put together a complete Thanksgiving meal that you can order ahead of time, and pick up the day before Thanksgiving. Everything is included right down to the cranberry orange relish! And since their chefs used to work their culinary magic at the Mad Batter (a great local restaurant), you can rest assured that it will be a tasty and satisfying meal. This option is perfect for groups (like those staying in our guest house) that want a home cooked, fully prepapred, high quality Thanksgiving meal, but without the hassle of preparing or cleaning up. Our family has enjoyed this approach a few times and we have to admit every time it was tasty and really enjoyable. The food was really well prepared and cleanup was a breeze. We highly recommend! Be sure to read the details on the menu (see graphic on the right), to make sure you get your order in on time and that you pick it up on time too (the day before, and before noon!). And finally, for a Thanksgiving meal bumped up to the realm of fine dining, we have a few suggestions. Washington Inn — You really can't go wrong with any meal at the Washington Inn. The service and food are top notch and they have one of the largest wine cellars in South Jersey. Their menu moves away from the traditional turkey dinner, but they do such an incredible job with all their meals that we're sure you won't miss the traditional fare. To help you decide if this is a good option click the graphic to see their menu. Ebbit Room — The Ebbit room is another establishment that's built a strong reputation over the years for having top notch food and overall fine dining. This is the one place where we haven't actually experienced their Thanksgiving meal, but when reseearching for this article, we looked at the menu it looked so good we thought we'd list it here. So there you have it, Thanksgiving in Cape May with options from making it yourself right on up to a dressed up meal at some of Cape May's finest restaurants. However you decide, just be sure you enjoy yourself and really give thanks since that's what's really important. And be sure to let us know how you made out. We'd love to hear about your Cape May Thanksgiving experience in the comments, so that insight can help out others next year. Posted on November 4, 2011 by Michael and filed under Vacation Value, Longfellow Recommends.